Beautiful sunny morning here although this brisk northerly is an early taste of winter. Can see those shower clouds over to the west which apparently had a wintry mix overnight. Might go out for drive later to see if there is any evidence of it! For the time being the showers seem to be clipping the western fringe of Pembrokeshire but they might swing further east as the day goes on. Year after year, it makes me sad to see how quiet the Wales forum is. Perhaps we should be merged with the SW and CS England or Midlands forums? I suppose so, Andy. I'm usually very cautious as we approach winter - the last three years have hardened me - but I'm much more confident this year. Snow is in the forecast for Capel-y-ffin tomorrow, (by far the coldest spot I've been able to find this far south with its own forecast from the BBC), when earlier it was plain rain. An interesting day ahead after these weeks of static weather. Currently light frost at -2.3C apparent. If today's forecast rain was being driven from the north then I would anticipate snow at this height. Alas, it's coming from the opposite direction and air temps should have sufficiently warmed by then to produce - drizzle. Dead calm at the mo, overcast, pressure 1005.8 and falling. Have fun everyone who has snow! Just hope ours will come in time,meanwhile I'm very happy with dry,crisp and frosty ! Really enjoying the excitement and anticipation already! Our turn will come!! Snow grains here, no doubt from the specks of precipitation ahead of the front as showing on the radar. Looks like we'll have to suffer a little unsettled spell before something more interesting which would be great timing for the start of winter. Back to the mild weather after Thursday's bitter winds. 10.5mm of overnight rain and still drizzling. Low cloud, 2.2mph breeze from the NW. 9.8C - pressure 1004.5 and rising. A good day to do the gutters. Yes looks very interesting indded! Already this October/November we've had some 12 frosts and 5 of them air frosts! 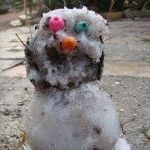 Twas January last year when we could say the same thing and winter is yet to start! 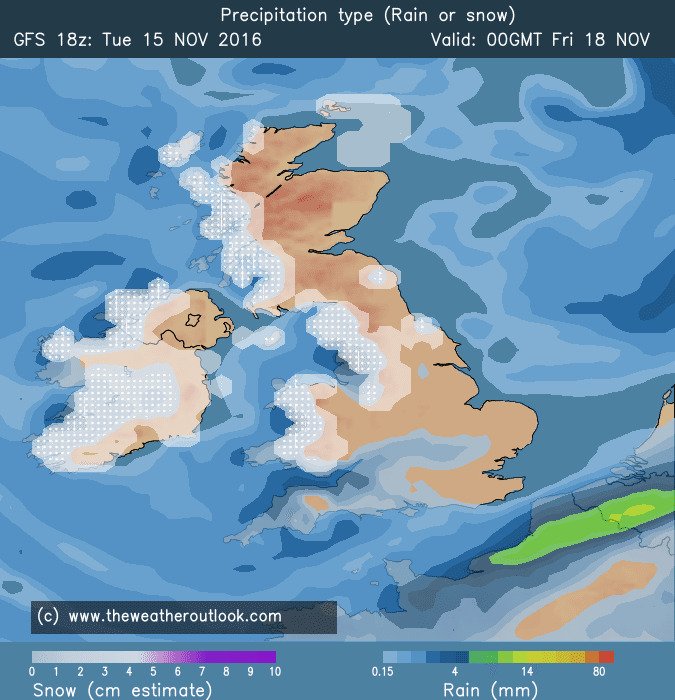 All bodes well for settling snow i.e colder temps drier soil, brilliant stuff. I've a feeling this year is going to be quite special and remember a Nwstly delivers best for Wales not the so called beasterly! Get a Nwstly first to give us a dumping of snow rhen a scandi high to keep us cold and get thos temps dropping! Winter on its way? 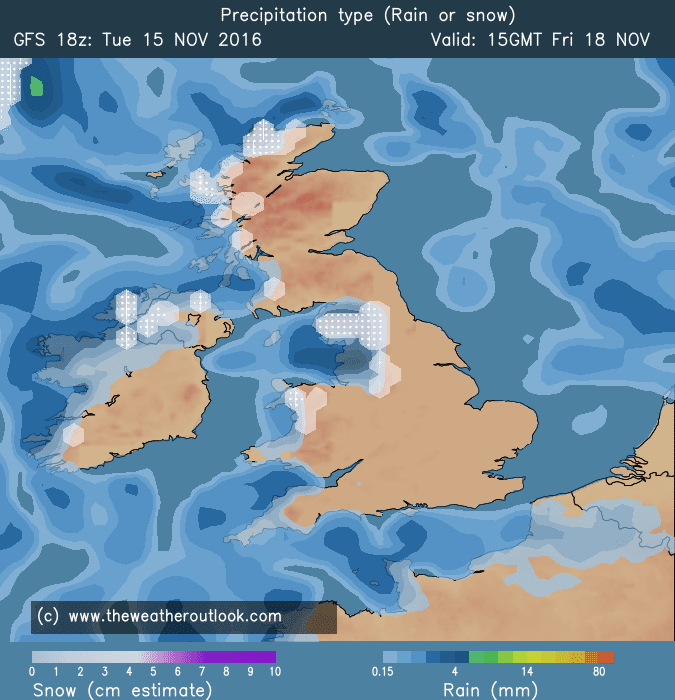 first signs of some wintry precipation on its way. 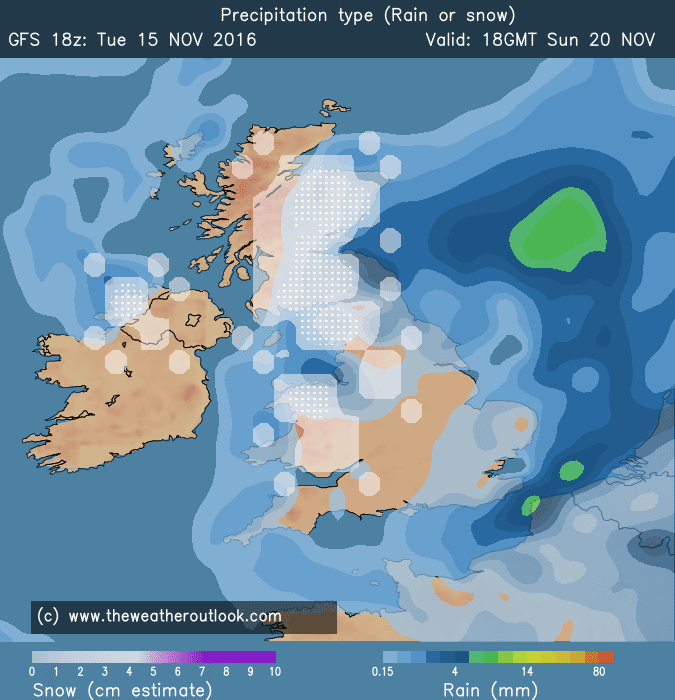 Yes Andy interesting weather this weeekend Thursday into Fridayi Tweet for various met office sources for a colder than average December. Wales could get a dumping out of this saturday night - will all depend how that low swings in but right now a really good chance of a dumping!!!!!!!!!!!!!! Real potential being shown today for things further down the line...hold on to your hats people....the winter rollercoaster has well and truly begun this year!!! Winter is well and truly knocking our door now! I think many places above 300m will see their first coverings end of this week, snow perhaps down to lower levels but little settling. Looking ahead could turn very nasty sunday with a deep depression, the questions remains whether this could in fact produce a huge amount of snowfall above about 200m in Wales - entierly possible. Rwy'n synnu ei fod mor dawel 'ma! Digonedd o gyfleoedd/potensial eira dros y dyddiau nesaf i Gymru yn enwedig dros dir uchel! Dewch mlaen, gadewch i ni roi bach o fywyd i'r fforwm 'ma! I'm bemused at how quiet this thread is! 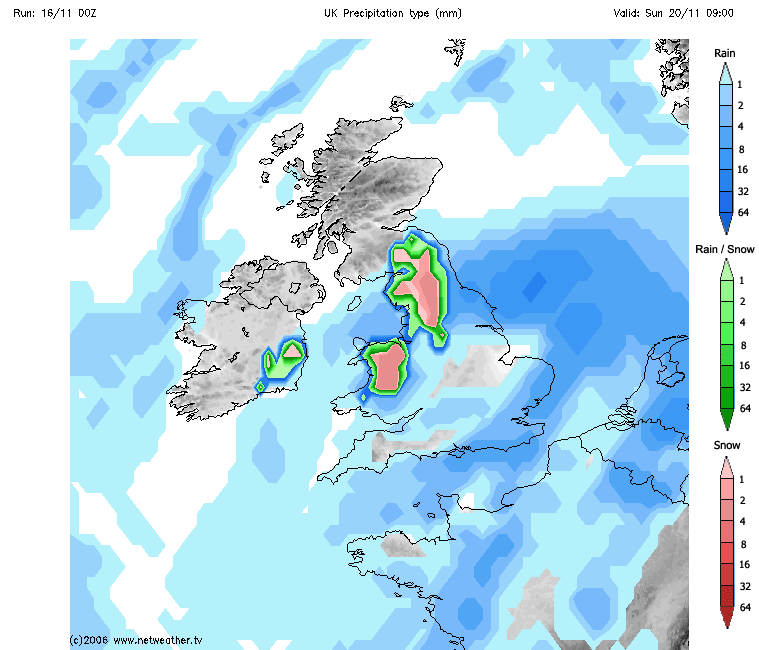 Huge potential and opportunities galore during the next few days for Wales especially but not only across high ground! Come on, let's breath some life back in to this thread! 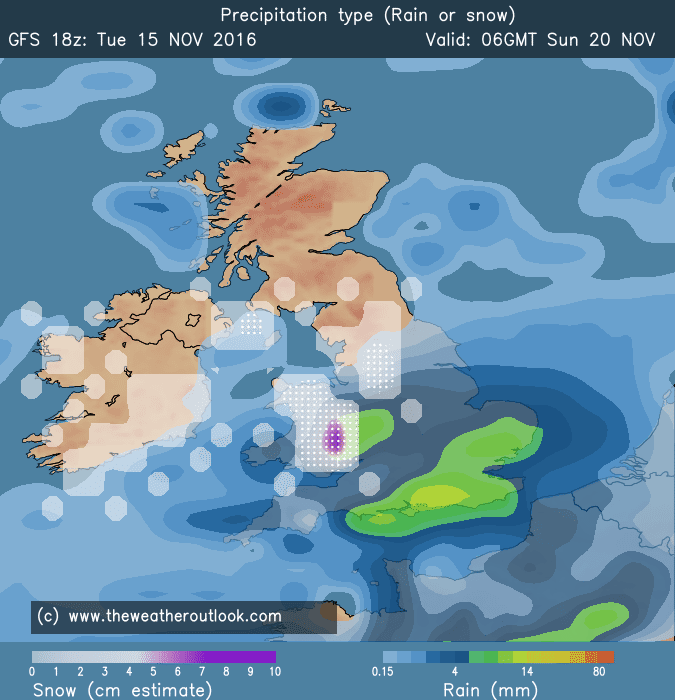 Tonights GFS 18Z Precip and Temps look great for Wales! If the winds remain northerly at the weekend then a good possibility. I am above 300m and the snow line in these parts is at about 200m. 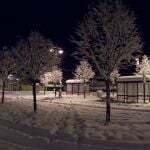 The snow used to arrive regularly just for a week at the beginning of December, then nothing until January. I have a feeling that the wind will veer westerly/south westerly and warm things up somewhat. We shall see!